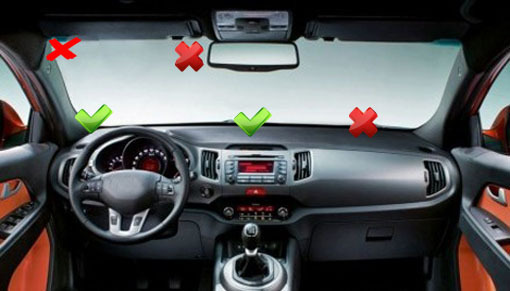 carNAVi FAQ (Knowledge Base) - Where is the best place for the windshield holder? What is the map coverage? Can I use carNAVi if I travel abroad? How can I set a more dynamic map zoom? How do I select 3D map view? How do I configure speedlimit alerts? This depends on your car, your driving habits and the local laws in your country. Since May 18, 2017 the RA10913 or the 'Anti-Distracted Driving Act' is in place in the Philippines, which forbids gadgets, such as mobile phones, dashcams or GPS devices positioned at a vehicle's windshield that directly distract the line of sight of the driver. In a statement from June 09, 2017 LTO said, the use of navigational devices in vehicles will be allowed as long as its height is up to four inches above the top of the dashboard, this is why we suggest to place the carNAVi GPS in the lower left corner of the windshield as low as possible down to the dashboard, following the same rules as in the US State of California. This position is quite safe not to distract the line of sight of the driver. Please remember, that placing an item at the windshield can hide some objects or persons in front of you on the road, while you drive. This is why some countries, like the US State of California and Switzerland are not allowing to place the GPS device in the middle of the windshield. In this countries - and maybe in others, too - it is only allowed to place the GPS unit in the leftmost lower corner of the windshield. - Never install the unit on the right half of the windshield, because it can be hit by the passengers airback and cause serious injury! - Never place the unit beside the inner rear mirror, this place is very unsafe, first the unit is hiding objects and persons in front of your car on the road and second it can become a dangerous object in case of an accident.